Street fights in Venice can change as quickly as the turning of the tide itself. While one minute it might be most important to hold ground, the next may see a gang advancing onto the rooftops to consolidate their position. These 36 cards contain every Agenda in the game, from killing opposing leaders to falling into the canal. 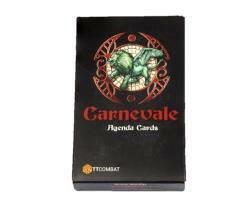 Simply draw the cards and follow the rules on the cover card to score extra Victory Points in your games of Carnevale. With lavish artwork and easy to read rules, this deck is the ideal purchase for anyone playing Carnevale. This upgrade to the rules in the rulebook makes picking Agendas easier than ever, and provides you with a handy reminder throughout the game! Made from high quality playing card material, these cards are oversized at 100mm x 60mm, and stylized after a deck of tarot cards.